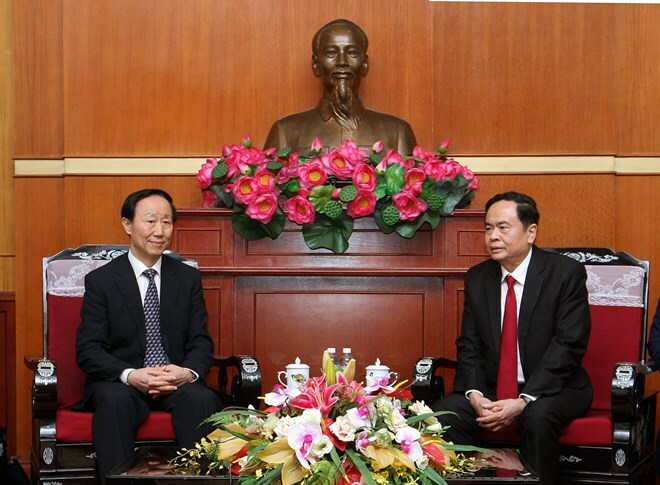 Hanoi (VNA) – President of the Vietnam Fatherland Front (VFF) Central Committee Tran Thanh Man received Chairman of the China Soong Ching Ling Foundation (CSCLF) Wang Jiarui, who is also former Vice Chairman of the Chinese People’s Political Consultative Conference (CPPCC), in Hanoi on April 2. The host expressed his delight at the growth of Vietnam-China relations as seen through frequent mutual high-ranking visits and fruitful cooperation in trade, investment, and tourism. While people-to-people exchanges between counterpart organisations have been fostered, friendship activities between residents in the countries’ border areas have also increased. Noting similarities in the roles, functions, and tasks of the VFF and the CPPCC, Man said the two sides have held annual high-level delegation exchanges as well as signed agreements to enhance cooperation between the two organisations at both central and local levels, thereby helping to consolidate their countries’ friendship. He also highly valued the CSCLF as a prestigious, people-based organisation that has contributed greatly to global peace, international friendship, and social progress. It has obtained numerous attainments in mother and child healthcare; education support; poverty reduction; scientific-technological knowledge popularisation; and literature-arts, sports, and healthcare promotion. The official voiced his hope that as CSCLF Chairman, Wang will continue helping to reinforce the foundation’s relations with the VFF and its member organisations, as well as to develop the friendship between the Vietnamese and Chinese peoples. For his part, Wang pledged further contributions to people-to-people diplomacy and the partnership between the CPPCC and the VFF.